Can English clubs catch up with their European rivals? Down and out? 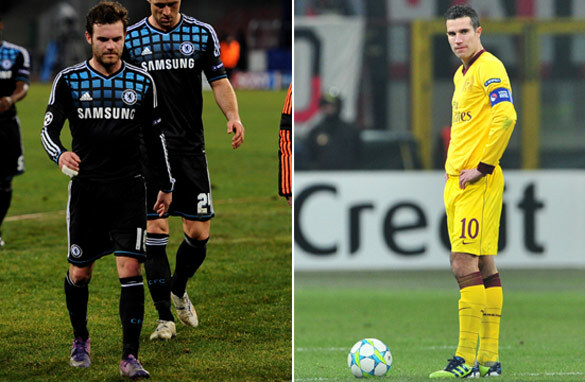 Both Chelsea and Arsenal suffered heavy defeats in their first leg matches in Italy (Getty Images). There is a very good chance that, for the first time since 1996, there will be no English teams in the quarterfinals of the Champions League. Arsenal and Chelsea have to overturn four and two-goal deficits against AC Milan and Napoli respectively, and it doesn’t look good. Why should we care? Because it has become a ritual for Premier League clubs to reach this phase of the competition. In recent years, two, three, even four teams from England have been part of the last eight. So it begs the question, what is going on? In my view there are a few good reasons for this. The first has to do with the quality of the Premier League. There is no doubt it is the most exciting competition on the planet with games played at a fast and furious pace. But what about the level of skill, technique and tactics on show? Overall, I would say that it is lower than in the other top leagues in Europe. This can be highlighted by the fact that no English team has won the Europa League (formerly UEFA Cup) since 2001. This shows that besides the top four, who have played at a high level for decades, the others haven’t been able to compete with rivals on the continent in the second-tier competition. Don’t get me wrong. The top three or four teams - usually Manchester United, Chelsea and Arsenal - have been great and England’s record in the Champions League proves that. However, since the gap between those clubs and the rest of the Premier League has been widening , perhaps they have become a little complacent both at home and abroad. Look at what happened to EPL champions Manchester United and current leaders Manchester City in Europe's top club competition this season. Last year’s Champions League runners-up United had a very accessible group with Benfica, Basle and Otelul Galati. They should have won the group comfortably, yet couldn’t finish in the top two. If you ask journalists in Europe they believe Alex Ferguson’s side were a little arrogant and thought they would not have to give 100% to win their games. Whether that is true or not, the fact is they couldn’t beat Benfica or Basle at home or away. As far as Manchester City is concerned, it would be fair to say they were unlucky with the group they got. Bayern Munich and Napoli are strong teams and it was always going to be tough to qualify. Which leads me to my next point. Teams in other European countries have been getting better. Forget Barcelona and Real Madrid, they have always been strong. I am talking about the top sides in Italy, Germany, France and Portugal. For example, this season there are three Serie A sides in the Round of 16 of the Champions League. There has been a renaissance in Italy with teams playing a more attractive, open style of football. AC Milan and Napoli showed that recently and even Inter Milan, with all their struggles, have been adventurous. Meanwhile, France had two teams in the quarterfinals last season, and could match that this year. Both Germany and Portugal, with Bayern and FC Porto primarily, have recently had successful runs in the competition. The final argument I will make here is that the two English clubs who qualified for the knockout phase of the Champions League were never going to challenge for the title. Let’s face it, Arsenal and Chelsea aren’t very good right now. They have lost 15 games combined in the Premier League. The Gunners have been largely a one-man show with Robin van Persie in spectacular form, while the Blues are stuck in a state of transition. As much as you can criticize axed Chelsea manager Andre Villas-Boas for his demeanor and overall attitude, you have to sympathize with him as he tried to push out the old guard and usher in the new. So as the English fans and the media get ready to face the prospect of seeing the Champions League without any of their teams for the first time in 16 years, perhaps it is time to take stock. Don’t treat it as a scandal, rather look around and see what you can learn. Try to raise the levels of technique and skill in the English game and accept the fact that this streak could not last forever. The EPL is totally devoid of skillful players. They play as if there is a gentleman's agreement between the clubs not to be too skillful and make other clubs look like amateurs. Now this has been downwardly affecting the skill level in the EPL. Look at clubs in Spain, Italy, Portugal even. You see skills, individual and team skills displayed and that makes their game improve. The EPL is stuck in kick-and-rush football. No wonder they always come up short against continental teams. Good analysis by the writer. "...quality of the Premier League. There is no doubt it is the most exciting competition on the planet..." !?!?!?!? No doubt!?!? La Liga could produce a tiny doubt, No? Well not in biased writers I suppose. Truth is, argue as you may, but there is Real Madrid and Barcelona...and everyone else. It´s not good for the whole of futbol, but it´s simply the truth these days. I agree somewhat that there are no individual skillful players to ignite the primiership at the moment.Tactical appraoch to a game is another factor.Roberto Mancini, for example, has the best handful players as compare to Gunners, Chelsea and even Man.U,yet failed to make it to last 16th of the Champins League. Let’s wait to see what next season brings since no English Team can make it to Last 8th this season. Really don't understand your point Pedro. So for the first time after 16 years the EPL will not have rep in the CL, you are suggesting that they improve their skill level as they are not good enough! And what makes you think the gap is widening at the top of the EPL. ? The big 4 days are over. Surely Spurs and City are now part of the top tier. Finally, the Europa league! This competition is unfortunately a complete joke. The entire structure and format needs a major overhaul, perhaps an article on that for the future to bring in some much needed debate. The answer is simple and easy for all the EPL problems. England should learn to grow their own talent and not buy it out. If they cannot figure this out they will never succeed. I can only see EPL teams failing even further and go into even more financial misery the way things are right now because quite simple they keep on buying talent and not grooming them. EPL is just the most marketed league and also the English language is most spoken language is the most spoken language in the world. Thats why is the most popular league. The epl started dominating Europe when the Italians had scandal in 2006 and suffered the most in Europe, while Spanish teams except barca and Real are facing tough economic times since 2003 and their players have come to England for money. the epl does not have the skills or talent the other leagues have, their good and kick and run football. the problems in the epl is the tactical point and lack of style and skills from there coaches and players the top teams are lucky that they have coaches that stays for decade that was ARSENAL and MAN U ,if not there will neva be any epl team that can win the ,UEFA and UEROPA. I think we should look at this down grading of EPL from all the point of views....many of us are blaming coaches and players!! Well according to history that says its 16yrs since an English teams has been in the last eight,...well reasonably I would say the English FA could have a hand in that they punish harshly any coach or player who has tried to be aggressive in the game or competition in terms of performance...if u see any other league,eg Lal liga or Italian Serie A the games are hard fought physically and tactically,,,,Man united's Antonio Valencia for example was booked for Body checking an opponent something that is very common in the other European leagues,that could in return make players reduce their amount of hard playing style of game,making them fear of a harsh punishment by the Ref and the FA......this will create fear of suspensions and fines,hence reducing their pace,goin on like this when in europe verses teams that are used to hard and phyiscall games, they are beaten. I think Pedro is right, EPL is short on skill compared to Barcelona who are way above the rest but what would you rather watch a boring tactical draw that is settled on penalties or an end to end match with goals. The EPL plays to what their watching fans demand. It is true , but is still the richest league in the world, and came attract good footballers, maybe after a couple of years we will make a better analysis. EPL is a rich football league. Where there is wealth and riches hunger may not enjoy a central place. To be number one, players need to toil and sweat taking risks and demonstrate enormous hunger in the middle. In the world of the super rich where is the room for hunger ? Like all others, players are human and mortal and tend to protect their places in the squad. WOW WOW all you please just calm down there for a second!! !EPL IS and will continue to be the best,league in the world unlike Spain where only to teams dominate.The fact of the matter is that the EPL is so competitive that everyone can beat anyone.Just ask AVB he will definately tell you.Why do you think EPL has the best and longest serving managers in the world? ?To the editor EPL IS about class not form.FACT IS that EPL teams have the biggest pressure in the world! !GET REAL!!! im sorry pedro i do not agree with you at all i like watching the spanish league only when Real Madrid is playing but other than that team is boring and slow on the other side i can watch any english team play anytime especially when Man U plays TO THE END MANCHESTER UNITED! concerning the europa league, it is rightly or wrongly considered a bit of a second class competition in the UK. The premier league is the competition that counts – either to get into the champions league or to survive. People also seem to forget that Fulham (very much a mid-table side) did manage to get to the final of the europa league in 2010, and birmingham city nearly managed to get out of their group (10 points vs 11 for the 2 teams that qualified) despite having being demoted to the second tier last season. Eat your heart out Mr Pinto. The EPL is the most exciting league in the universe. Ask any football supporter anywhere in the world. You obviously have something against the English but as a reporter you should be writing objectively. Yes, at present the Spanish have a few very good teams and the Germans have one. But why you mentioned Portugal is beyond me. Oh yes, I forgot! So, hang on a minute, the first season in ages that English teams have done poorly and all of a sudden it's endemic of the poor state of English football? What is this writer on about? The facts are over the last 10-15 seasons, premier league clubs have been the most successful in europe, which is why the premier league is ranked number 1 by UEFA. Using a second tier tournament (the Europa league) that English clubs to not rate or care about is ridiculous, they dont care about it, so field second string teams, they care about doing well in the Premier League! Poor, article and goes to show that you need a lot more strength in depth in your football (or do you call it soccer) commentary. As for Joe (3/20/12).....EPL are fortified teams from different countries. Without these players English Football pathetically lack skill. Plenty of brawl no doubt is very evident. EPL success and monied ,yes because fans have no choice but to spend their monies to watch this brand of make believe quality football. Maybe it SHOULD be called soccer or "sucker" for paying to watchEPL! Imagine which country had the better coefficient in the UEFA ranking, last year: 18.800 points? UEFA league – its a long time since anyone really big has won it (possible exception of Porto) = big european teams don't rate it when compared to champions league (not just english teams). Its something that some teams would rather not get into as extra games affect your league form. The fact that 3rd place in the CL group gets you into the europa league really degrades the competition for me. "The first has to do with the quality of the Premier League. There is no doubt it is the most exciting competition on the planet with games played at a fast and furious pace." I totaly doubt this. Actually the german league is the most diversified and most exciting league, where u never know who will take the trophy in the end, not just the same three teams on the top like in most european leagues, where the rest is to ignore. Also u find the most crowded and most modern/secure stadiums in germany. No other country has so many spectators in their stadiums..
Great article... really well thought through shame that Chelasea the 6th team in EPL has just defeated Barcelona using the 'premierleague' way of playing! Champions league final! Somebody needs to rethink a new article!! So how stupid do you feel now? Chelsea just knocked out the wonderful Barcelona while only playing with 10 men. Lets not forget Arsenal beat AC Milan 3-0 and Chelsea knocked out Napoli and Benfica. Oh and by the way, How competative is the EPL? WEll the 6th place team in the EPL just beat the supposed best team in the world over 2 legs. Pedro Pinto, did you see the chelsea/ barca semi-final game yesterday? Do you still want to hold-on to your worthless prediction? It's clear that you know very little about English football, especially about the blues and their ability to make great comebacks! i guess that told you!!!!!!! This article is thunderously amusing, given that it presupposes English inferiority in an era in which eight English teams have reached the Champions League final in the last eight seasons – a run unprecedented in the entire history of the competion since 1955. Can the English "catch up", asks Pinto? To who??? Premature article indeed. Now there's no Spanish Team in the CL Final and Chelsea are in the final. So much for "Chelsea aren't no good". You jumped the gun big time on this one. Another so called expect (Robbie Savage) said Arsenal wouldn't finish in the top seven of the PL having made a poor start. Please check the table. My point is this, writers/ex professionals should stick to highlighting informative views on how teams play and where their strengths and weaknesses are. Many simply just point out the obvious and predict who they feel will not succeed having made poor starts (anyone can do that). It's mostly ex football managers who appear in newspapers and on TV who give the best insight into the ability of teams and players but once these experienced expects get "old" they are removed from TV and end up on radio instead. You might wanna reconsider what you wrote now that you can see that Chelsea is in the final and the beat the "best team in the world" Barcelona. And they are 5th in the PL. EPL is defiantly the best in the world, firstly Chelsea saw off the likes of Barcelona to reach the Champions League final and will probably go on to beat Munich. Secondly if La Liga was merged with EPL, apart from Madrid and Barcelona who would feature in the top four. La Liga teams would struggle to beat any EPL teams, even the teams which fight for relegation in a normal season. Some of the bottom teams in La Liga would not be out of place in leagues 2 or 3 below that of the ELP. The skill and money difference between the EPL and La Liga is massive. This article is rubbish. Chelsea beat Barcelona so take stock silly writer. Another UEFAlona supporter who thought Barcelona would never lose to an EPL team in the semi-finals. Thank you Chelsea for beating them X 2. Pedro is horrendous at his predictions...first he says Liverpool have had a failed season and should sack Kenny but now they are in the FA Cup final and won the LC and now he talks about how rubbish the PL teams are despite once again having another team in the final...and no Spanish ones. Think Peds needs to keep his mouth shut when talking about the future and concentrate on the past. "Try to raise the levels of technique and skill in the English game and accept the fact that this streak could not last forever." Hey Pinto..... any more advice? How about a companion piece to this hilarious article?